FLORHAM PARK, N.J. (AP) — Henry Anderson has a tiny red scar in the middle of his neck that’s easy to miss because it’s nearly hidden by a crease in his skin. 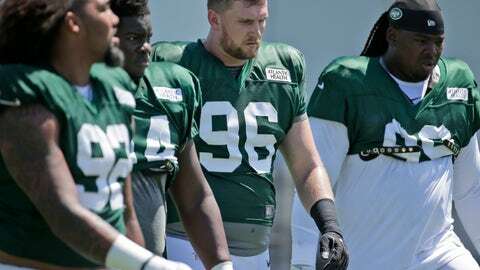 The New York Jets defensive lineman knows exactly where it is, though, and it serves as a clear and constant reminder to him of the fluke injury — a fractured larynx — that could have very easily turned out a lot worse. “I’ve definitely had injury problems, so some dumb injury like that probably would happen to me,” Anderson said after a recent practice. Anderson was playing for Indianapolis last Nov. 5, when he rushed Houston’s offensive tackle while trying to make a play — and, then, felt the crushing blow. Anderson didn’t think much of it at first, having taken lots of hits to his throat area throughout his football career. So, he kept playing. The Colts won 20-14 with Anderson notching three tackles in the game. But as the hours went by, Anderson soon realized something was definitely wrong. He went through tests and exams, which revealed the laryngeal fracture. Commonly called the voice box, the larynx is a muscular organ involved in breathing, producing sound and protecting the trachea. If he had been hit there again while playing, he could have died because his air supply could have been stopped. “I could only really whisper for a few days and couldn’t really eat much food for, I want to say three or four days,” Anderson said. Doctors realigned the cartilage in his throat and pinned it down, Anderson said. He started feeling better within a few days, and was relieved to know his football career wasn’t over — as he initially feared. “Yeah, that crossed my mind,” he said. He also had to get over some initial uneasiness on the field during offseason workouts with the Jets in the spring. Anderson is focused only on football now and winning a spot on New York’s defensive line. He has been rotating throughout training camp with rookie Folorunso Fatukasi at defensive end opposite Leonard Williams on the starting unit. Anderson, drafted by the Colts in the third round out of Stanford in 2015, had a promising rookie season that included two sacks but he tore a knee ligament midway through. He bounced back and played the following season, and then appeared on his way to a possible breakout year in 2017 before the throat injury. Anderson played his first three seasons in a 3-4 defensive scheme with the Colts, but they planned to move to a 4-3 base this year. Defensive ends in 3-4s are usually lined up on the tackle or the guard and take on double teams, but those in 4-3s play a bit more out in space and are typically faster and less bulky. So, Anderson, who played at 295 pounds last year, started losing weight in the offseason to prepare. But, the Colts ended up trading Anderson to the Jets during the NFL draft in April for a seventh-round pick. Bowles and the Jets run a 3-4 base defense, so Anderson needed to bulk up again after dropping about 28 pounds in the offseason. “I put a lot of pressure on myself to try to gain it back the right way and still eat the right way, and not just sit there eating cheeseburgers and pizza all day,” he said. When the Jets finished minicamp in June, Anderson went to work with his trainer, who set him up with workout and eating plans that he followed closely over the next several weeks. He reported to training camp at about his regular playing weight of 295.